Nina offers the rare freestanding whirlpool. You can also choose the heated bubbles of the Thermal Air or soak in deep waters with the Soaking Tub. Any of these can be combined with the Hydro Blanket tub shell heating system. 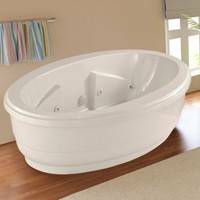 A classic, oval freestanding bathtub that is updated with all the modern amenities. Not only a feast for the eye but the body as well. The center drain and two backrests create the option of two bathers reclining face-to-face. Nina features 1/8" thick layer of deep lustrous acrylic and extra thick reinforced fiberglass. Bathtub Size: 72" x 44" x 22"